I do not find all texts as interesting as the next and I especially did not really read the texts in French. I can read French with a lot of effort, but I usually skipped through the texts to try to see if they were interesting enough to make that effort. 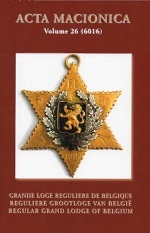 What I like mostly about the <emActas is that, even though it is a publication of the relatively small and only “regular” Grand Lodge of Belgium (the Regular Grand Lodge Of Belgium), there are also references to other Masonic orders and to subjects that caused schismas within Belgian Freemasonry. So, the latest Acta Macionica again makes a good read with a few very interesting and with (to me) less interesting subjects. It helps if you master your languages, but since the book is not very expensive, it is still a good buy when you can only read half the book. Only available from the Regular Grand Lodge of Belgium. Click on the cover to go the the Ars Macionica website where you can find the tables of content of all 26 volume. I believe they are all available.